- Who wrote the Bible, and when? - How reliable is the Bible when it comes to history, science, ethics, or other topics? - How do we know that the Bible we have today is the original Word of God? - Why were some books included in the Bible and others left out? Written in question-and-answer format for easy access, these quick reference guides provide succinct summaries of authoritative information so readers can be confident of what they read and be prepared to discuss these topics with family, friends, or neighbors accurately. 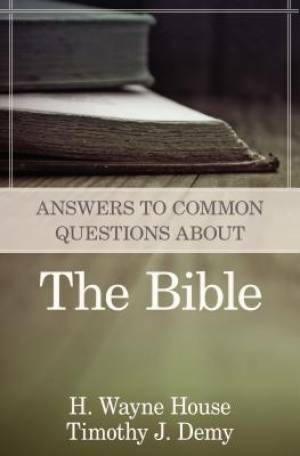 Answers to Common Questions About the Bible by H. Wayne House was published by Kregel Publications in November 2013 and is our 69438th best seller. The ISBN for Answers to Common Questions About the Bible is 9780825426551. Be the first to review Answers to Common Questions About the Bible! Got a question? No problem! Just click here to ask us about Answers to Common Questions About the Bible.